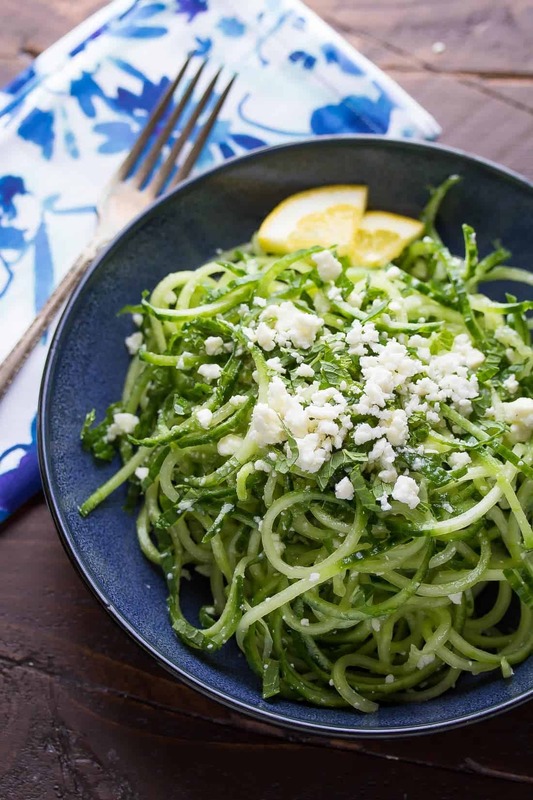 This spiralized cucumber salad comes together in under 10 minutes! 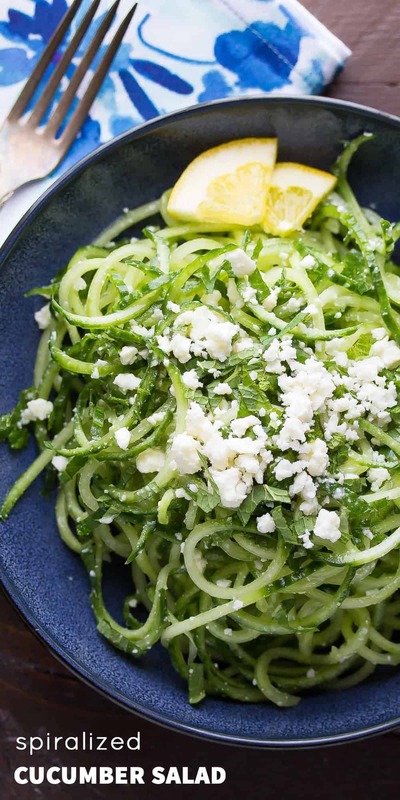 Cucumber noodles are tossed with feta and mint in a lemon vinaigrette. Low carb and gluten-free! I’m just back from an absolutely amazing weekend in Salt Lake City where I attended my very first food blogging conference! While it was great to learn all about food blogging and eat all of the food, the highlight for me was to meet my favorite blogging ladies. We’ve known each other for nearly 2 years and talk to each other daily, but we’d never met in person before! And they were just as fabulous in person as they are online! 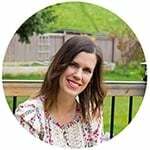 So, because yesterday was a holiday in Canada, and because I a was justalittletired from the weekend, I’m posting this spiralized cucumber salad recipe on a Tuesday! This recipe is SO simple, and super fast to whip up. I almost didn’t want to post it, it’s that simple! But I figured that if you are like me, you might occasionally leave things last minute, and need a fresh and simple side salad recipe for the picnic/barbecue/birthday party you’re attending. And you know what? Sometimes simple even tastes better. to make cucumber noodles….I hadn’t broken it out since I made this Asian Salad with Salmon, Ginger and Lime Dressing! I actually found that it made the cucumber noodles too long, so you may wish to cut them up a little bit to get them a little shorter. 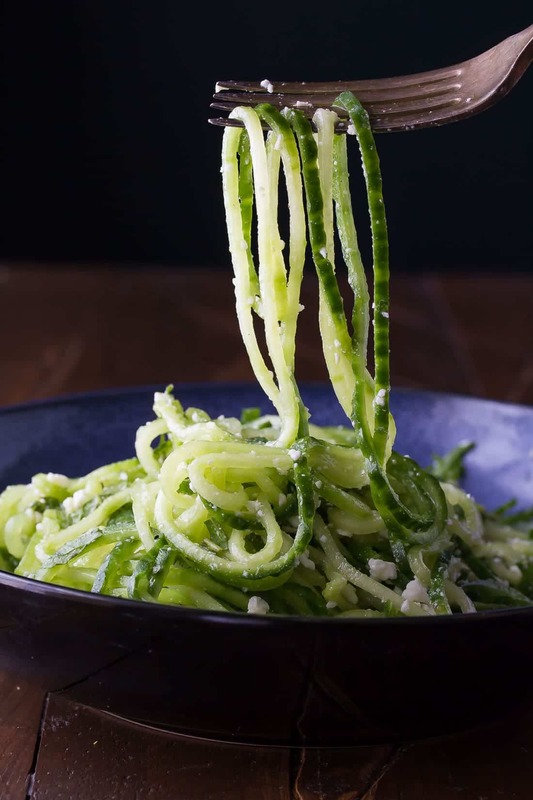 Once the cucumber noodles are made, shake together a super simple vinaigrette: lemon for flavor, white wine vinegar for the tanginess, and honey for a touch of sweetness. Toss it all together with some fresh mint and crumbled feta cheese. Happy Tuesday friends! I will be back on Thursday and I’m (hopefully) bringing us a slow cooker dinner recipe! This spiralized cucumber salad comes together in under 10 minutes! 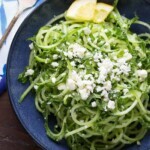 Cucumber noodles are tossed with feta and mint in a lemon vinaigrette. Shake together all vinaigrette ingredients (may take a few minutes to get the honey completely dissolved). Toss together all salad ingredients in the vinaigrette just before serving. This salad doesn't keep very well and should be prepared just prior to serving. This makes 4 side servings. Feel free to double or even triple the recipe for a crowd! Can you make this ahead of time and just add the Feta before serving? Solved my own problem. Combined the cucumber and mint in one bowl, the dressing in a second and the feta in a plastic bag. Everything is ready to go when we leave for dinner in a few hours. Will combine it when we get there. Looks great. So glad to hear this and apologies for my late reply (just got back from holidays). Glad to hear it worked! Never apologise for simple, Denise! It’s quick ideas that I’m always looking for, and this one is beautiful to boot! How lovely that you got to go to a food conference and meet some of your bloggy friends! I’ve been tired this week after the conference, and simple has never looked so good! I’ve been playing around with cucumber noodle salads lately and love this version! It was so nice meeting you Denise, and everyone really was even better in person! Would you believe that I’ve never spiralized cucumber before?? That’s changing asap because this salad is GORGEOUS and totally needs to be my lunch today! This salad looks AMAZING Denise! It`ll be a great addition to a BBQ I`m hosting this weekend! Can`t wait to try it! It was SO nice to finally meet you and everyone! I had such a great time 🙂 Love this spiralized cucumber salad! It looks incredible – so refreshing!! I am dying to buy a spiralizer now Denise and glad you had a great time at the conference! Wish I was there too! This salad looks so great and sounds perfect for hot weather!! I LOVED meeting you this weekend Denise! I can’t believe we all finally got to meet…SO fun! This salad looks so delish too and totally feeds my new obsession with feta. Love this! It was SO nice to finally meet you, Denise! I had such an amazing weekend with everyone. Can’t wait to all get together again! Now onto this salad…I’m embarrassed to admit that I don’t like cucumbers, but my husband LOVES cucumbers! He would be so impressed if I made this for him! It was so nice to meet you too, Gayle! I want to go back! LOL!